Heading to the USA's City of Lights? Book a Las Vegas holiday package and get ready to explore the world's ultimate adult playground. Whether you're organising a group trip with your closest friends, visiting the city for business or flying solo, a holiday package will take the stress out of planning your trip. Webjet curates specials from leading airlines and hotels to ensure you're getting excellent value for your money. 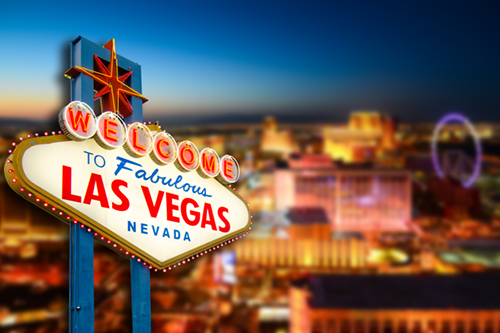 All you need to do is enter your travel dates, choose the deal that matches your budget, and you're off to Sin City! Start searching the latest Las Vegas holiday packages from Australia with Webjet's powerful search engine. There are flights to Las Vegas from Brisbane, Sydney or Melbourne. However, the cheapest and shortest route is from Sydney International Airport (SYD) to McCarran International Airport (LAS). The flight time between these two cities is 17 hours, but trips can take up to 37 hours depending on your stopover destinations. The major airlines that service flights between Australia and Las Vegas are Air Canada, Qantas, Virgin Australia, Air New Zealand and China Eastern. When you arrive, LAS is only eight kilometres from Downtown Las Vegas. A trip to the strip hotels should cost between $12USD to $17USD, and there are affordable public transport options as well. The best place to stay in Las Vegas is around The Strip. It's close to all the action and within walking distance of the countless activities. By booking a Las Vegas package, you can get room discounts from some of the top themed resorts and budget hotels. The Bellagio is an Italian-themed Five Diamond Resort & Casino. It's known for its dancing fountain show and incredible views of the Las Vegas Valley. Inside the hotel, you'll find a spa, fitness centre and five luxury pools. Enjoy a drink at one of the on-site bars or hit the strip and attend one of Las Vegas' popular live shows. The Hilton Grand Vacations Suites is a quality hotel that's perfect for mid-range budgets. Located to the north of The Strip, the hotel is nearby the city's signature attractions. The lobby and rooms are decorated with "Desert Deco" design and dramatic decor. It also boasts elaborate swimming pools, rejuvenating spa treatments and exercise facilities. Located just off the Strip is Motel 6. It's one of the best accommodation options in Las Vegas for travellers on a budget. The motel itself is basic, but the rooms are decorated with stylish minimalism. There is also a pool to keep you cool, and it's only two kilometres from all the attractions. Las Vegas is a city full of fun and excitement. Located in the Nevada desert, it's larger than life resorts, glamorous casinos and erupting volcanoes make it an incredible city break destination. Walk along the famous strip, and you'll find unique museums, impressive live shows and countless other things to see and do. The Strip is a 4-kilometre long section of Las Vegas Boulevard. Along the street, you'll find luxury hotel rooms, fine dining restaurants and entertainment palaces. If you want to soak up The Strip experience, book a hotel at one of the resorts and explore the endless succession of glittering neon lights at night. A trip to Las Vegas isn't all about casinos and musical performances. Head out of the city for a helicopter ride over one of the USA's most impressive natural wonders. If you have the time, sign up for a full day trip. It's a 6.5-hour tour that will take you over the city as well as the Grand Canyon. Want a unique Las Vegas experience? Sign up for an indoor skydiving lesson! It's a fun way to discover what real skydiving is like without having to muster up the courage to jump out of a plane. You'll have a qualified instructor with you the entire time as you float effortlessly through the air. The best time of year to visit Las Vegas is from March to May and September to November. You'll find plenty of Las Vegas accommodation and flight package deals, and there are smaller crowds at the city's top attractions. December to February is Las Vegas' high season. As the temperatures dip and the holiday parties kick off, the city is at its busiest. If you're hoping to ring in NYE's in style, book your holiday packages a few months in advance. Despite the sweltering temperatures, Las Vegas is still a popular summer destination for families. While hotel rates aren't as expensive in winter, you'll need to get to the pool early if you want a good spot.